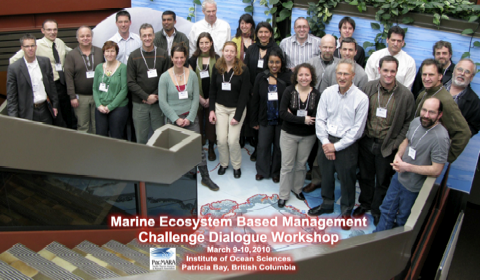 On 9-10 March 2010, PacMARA held a Marine Ecosystem-based Management (EBM) Workshop for Canada’s Pacific coast and ocean in Sidney, BC. Participants from academia, federal government, First Nations, industry, provincial government, and NGOs came together to contribute to the ongoing dialogue known as the Marine EBM Gaps Challenge Dialogue. The workshop was successful in producing a set of guiding draft Marine EBM Principles relevant to British Columbia, a Logic Model that summarizes rationale, drivers and desired outcomes, and suggested innovative approaches to joint planning, shared governance and enhanced collaboration. The Marine EBM Principles (“The Sidney Consensus”) were finished in October 2010 by a workshop working group, and are available here. Jon Chamberlain, BC Ministry of Agriculture and Lands; Kai Chan, University of British Columbia; Heather Coleman, PacMARA; Steve Diggon, Coastal First Nations; Dan Edwards, Area A Crab Association; Kim Houston, Fisheries and Oceans Canada; Michelle Molnar and Bill Wareham, David Suzuki Foundation. The next step in this process will be to collaboratively create a Strategic Roadmap to guide shared EBM implementation. We are currently applying for funding to conduct this workshop.